Thank you to Verizon for supporting PSI High! Recently, Verizon donated $15,000 to PSI High. These funds will not only help fund the program but provide additional resources to cultivate business education. 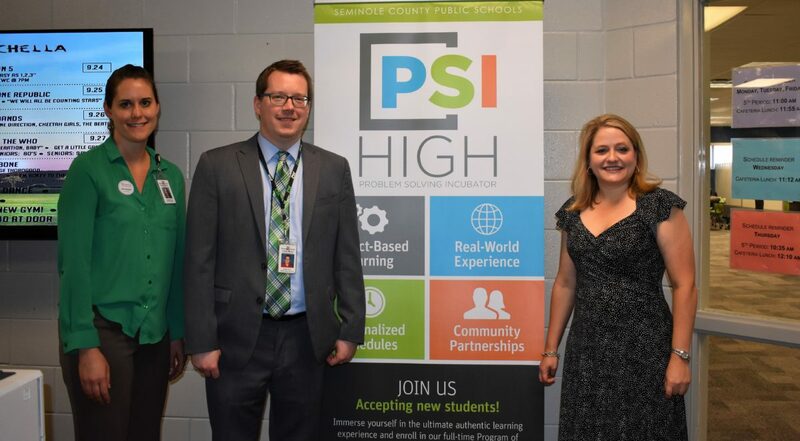 PSI High, the Problem Solving Incubator, is a project-based, design thinking program grounded in business partnerships. Students earn high school credit through projects to solve community and business problems, while our teachers serve as mentors and project managers. Learners take 1-3 courses in core curriculum subjects and the remainder of each day is dedicated to learning through three types of projects – business partnership projects, teacher led projects, and individual passion projects. Students in the program build career ready skills and cultivate entrepreneurial values. Our students, educators and district leadership were excited to welcome Verizon representative Julie Smith and showcase this innovative program. Thank you Verizon for supporting the students and teachers of SCPS!